Three friends. As they move through life, experiences are imprinted on their flesh and in their bones. This is the shared journey of three individuals from cradle to grave, forward in time and backwards in memory. Beautiful Bonesexplores how the past is written on and through our bodies, and how the future may already be deeply embedded within our physical selves. 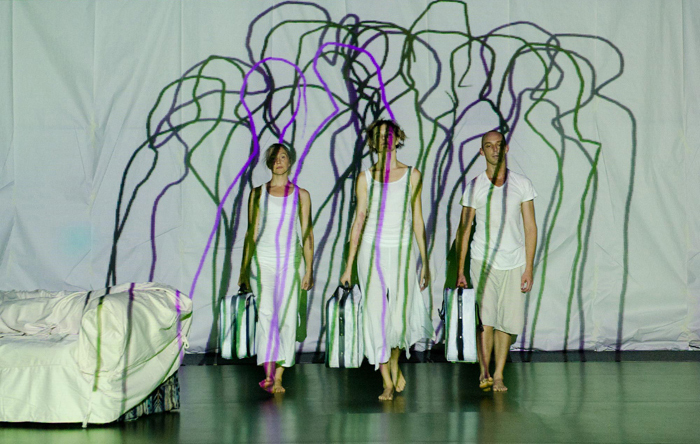 Beautiful Bones is a stunning locally made dance work created through NORPA’s Generator program. Directed by Brisbane-based choreographer Brian Lucas and featuring three local dancers – Philip Blackman from Lismore (who recently performed in NORPA’s Railway Wonderland) and Marissa Treichel and Tracie Crockford from Mullumbimby. Developed over 2 years this multi-media dance work also features local artist Kellie O’Dempsey who will draw live illustrations during the performance that are projected on to the dancers bodies and the space.